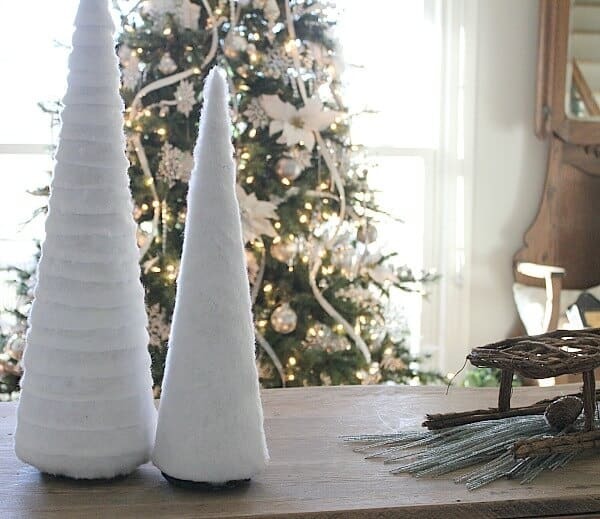 Simple, Welcoming, and most important – Cozy. 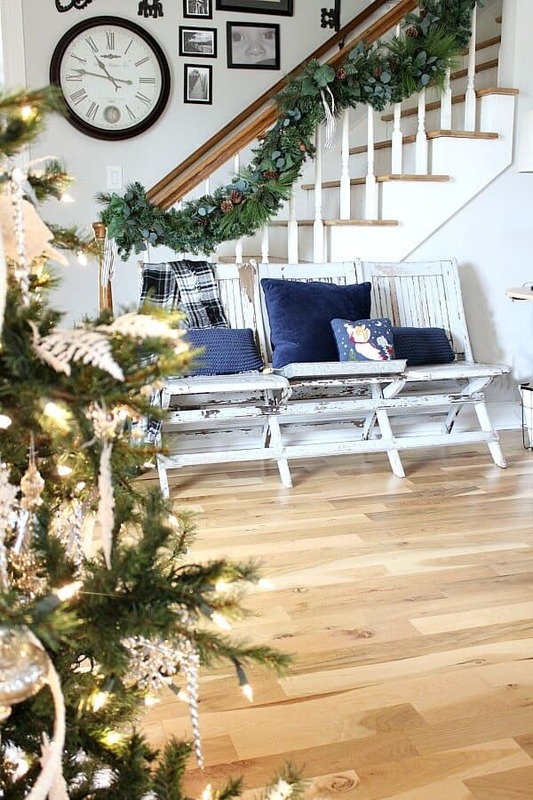 A home where memories are made this Holiday season. That is my goal for my decor this year. From the moment you walk through the door. 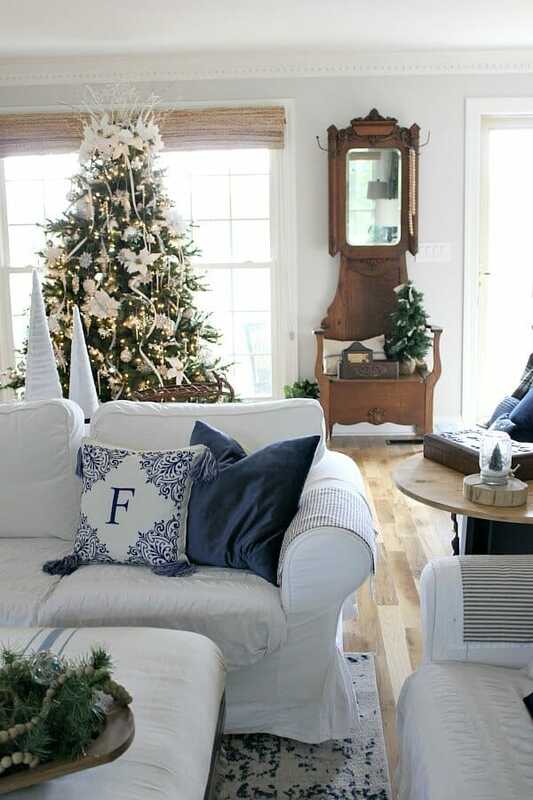 A Cozy Christmas Family Room is all I want for this home. 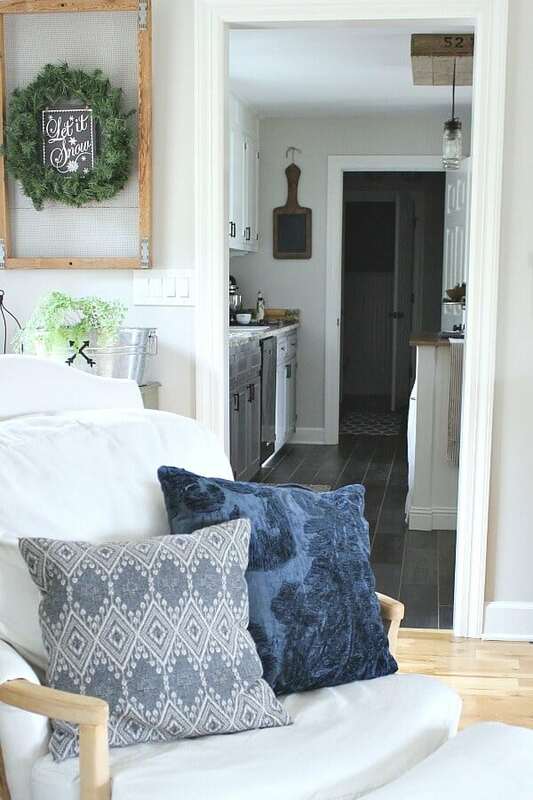 This week, 34 amazing bloggers have gathered together to share their homes, and when Jenna from Wife in Progress asked me to participate – I jumped at the chance, of course! 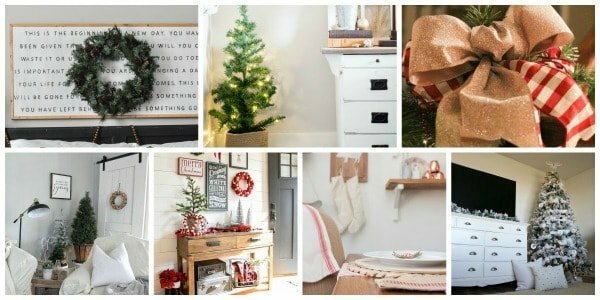 You will find links to all the blogs at the bottom of this post and will surely be put in the Christmas spirit after seeing their gorgeous homes! 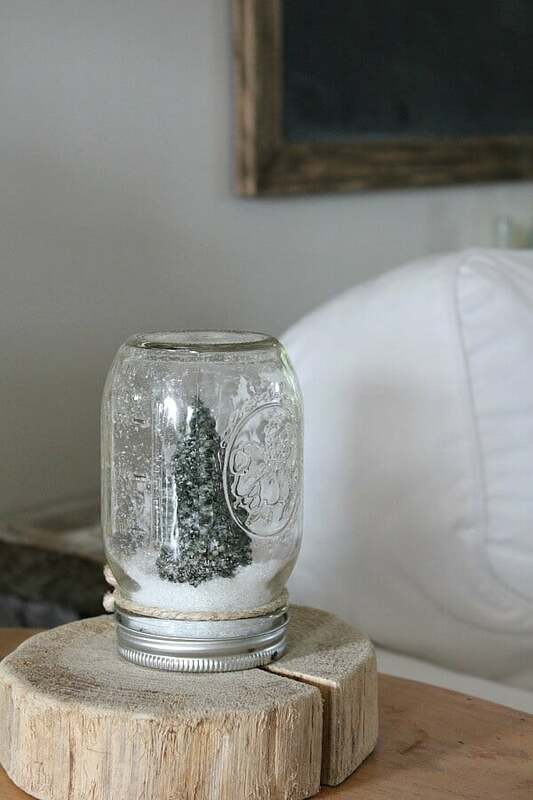 If you are here from Kendra blog, Joy in our Home, welcome! 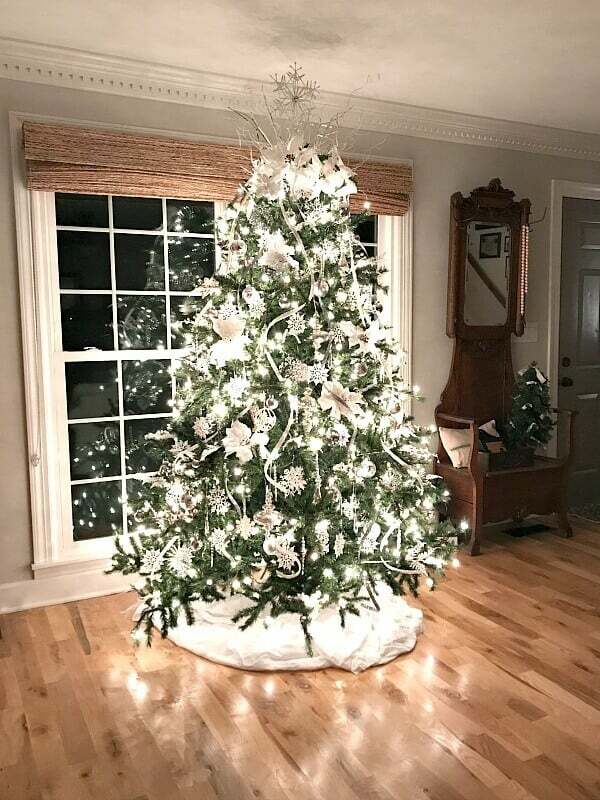 While I’ve shown you spatterings of rooms decorated for the season the past few weeks, I’ve waited until today to reveal my tree and my family room in it’s entirety. Let’s start with my entryway. 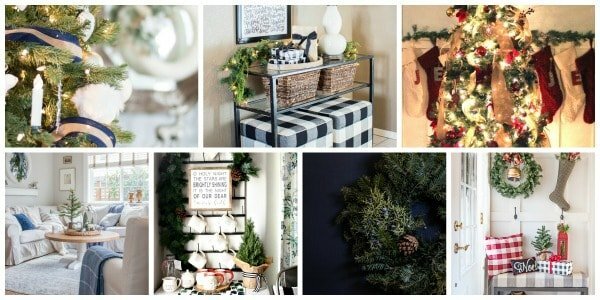 Since I revealed my Christmas Entryway earlier this week, you may have seen some sneaky peaks of my room, but what I didn’t show you was what you see when you walk in my door! Squee!!! 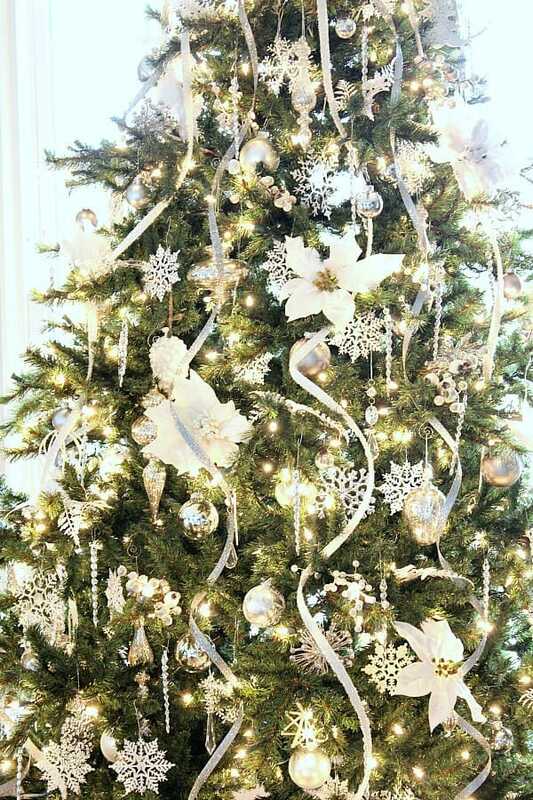 I just love my sparkly, snowflake tree! 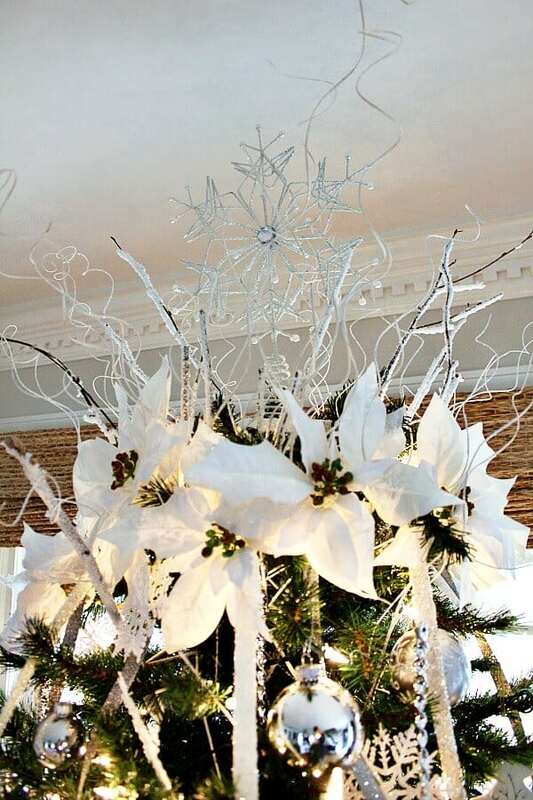 Icicles, snowflakes, shiny baubles and curly garland paired with crystals and glass bulbs. It’s the only slightly austere thing in my room, but it’s not about the fanciness – it’s about the simplicity of color and sparkles it gives at night. 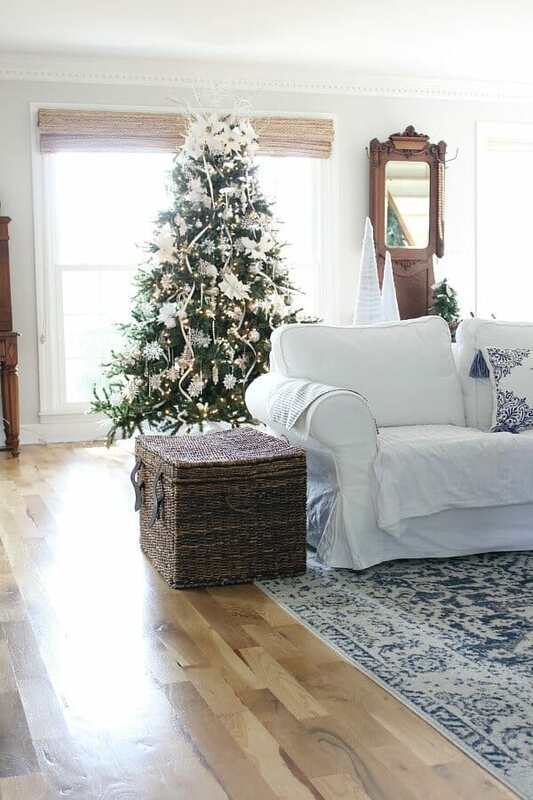 For my family room, my hope is that you want to slip off your shoes, grab a blanket and a cup of cocoa and sit and chat while looking at the tree. Since these pillows from Homegoods reminded me of snowflakes, I thought they would be a perfect pairing with my snowflake tree. 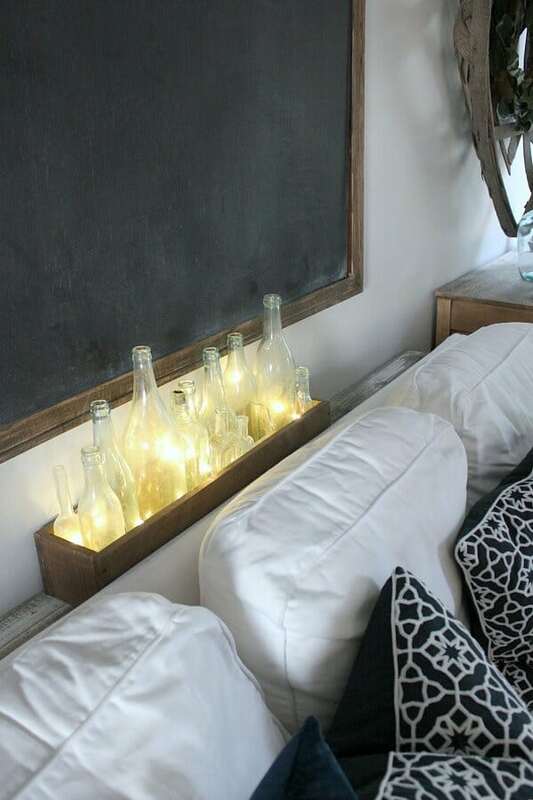 The vintage bottles behind my couch have battery operated LED lights that glow in the evening, creating a warm, cozy environment. 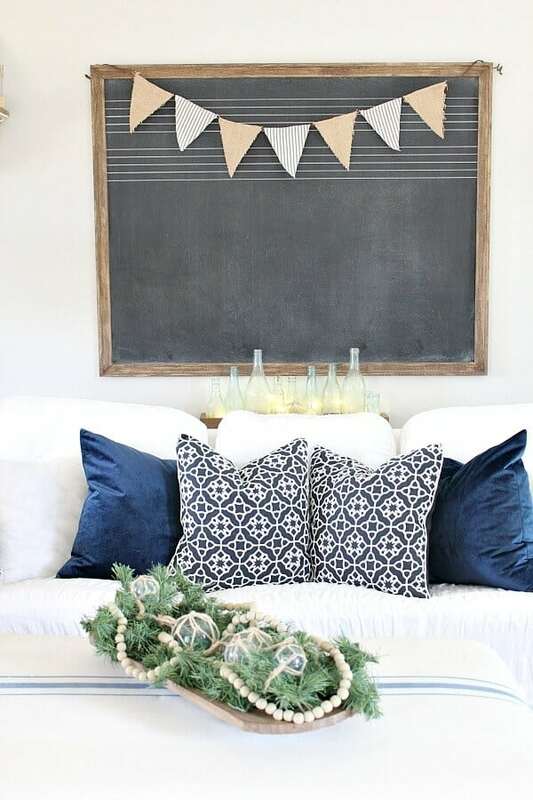 I kept my DIY Fall ticking stripe bunting and updated it for Christmas by simply removing the burlap leaves. Aren’t these fishing weight glass ornaments the coolest? 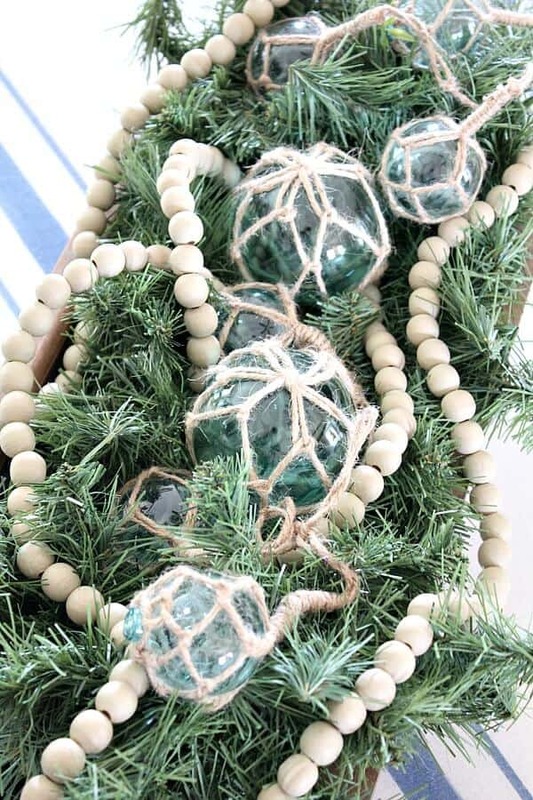 Blue glass balls wrapped in twine, snuggled in a nest of greenery and wooden beads make me happy! Keeping with the cozy theme, my fireplace mantel is styled with a simple snowflake and warm lights. My deconstructed chair next to my fireplace is my favorite spot to sit and relax this season. 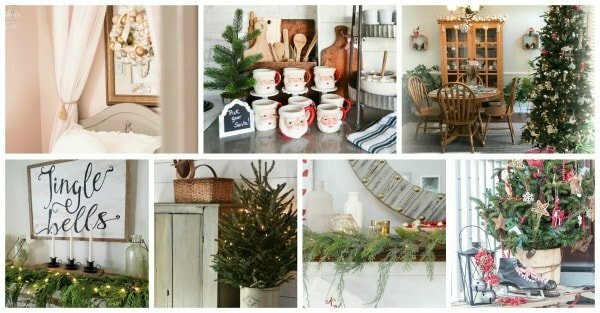 Of course, you can see how I Christmas-fied my kitchen here. 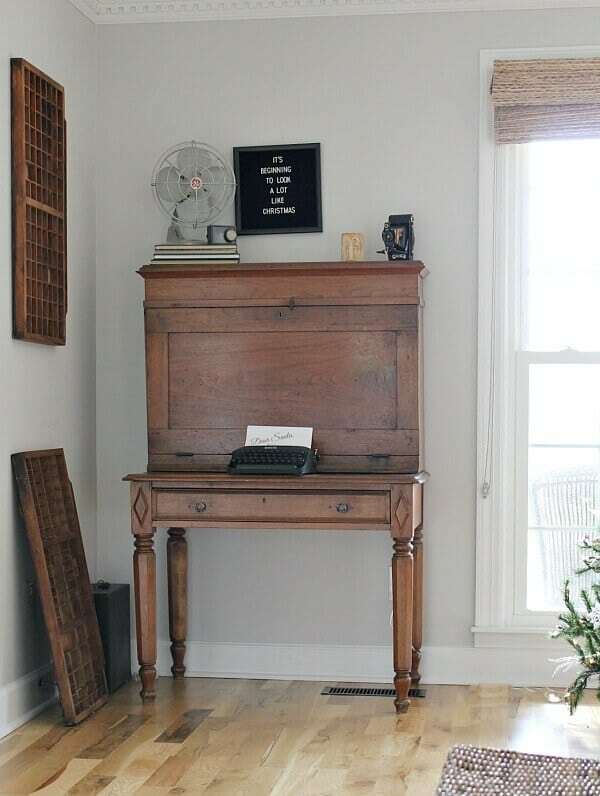 One last little corner that I’m loving this season is my Plantation desk, filled my vintage favorites. I made the cutest printable for my old typewriter. I played around with some of my favorite fonts and printed it off. By all means, feel free to copy this idea! 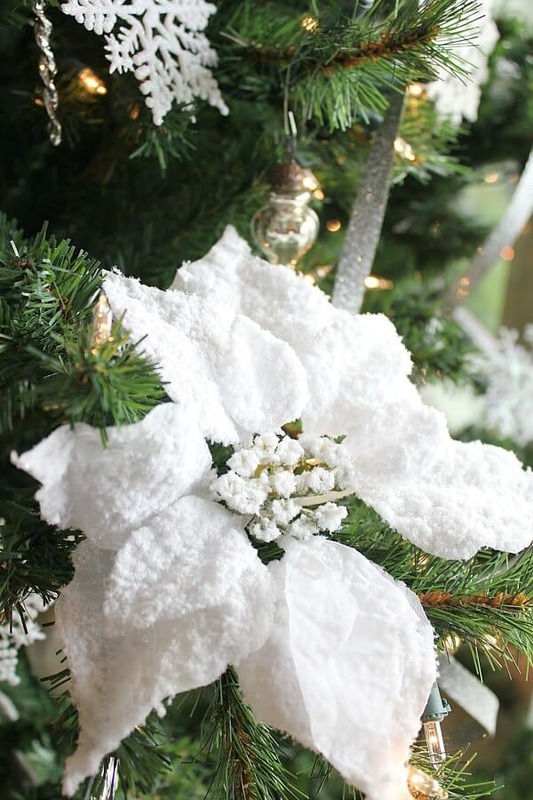 Adorned at the top of my Christmas Tree is a combo of poinsettia blooms, sparkly and snow covered sticks, and curly-q’s. And, of course, my snowflake topper. 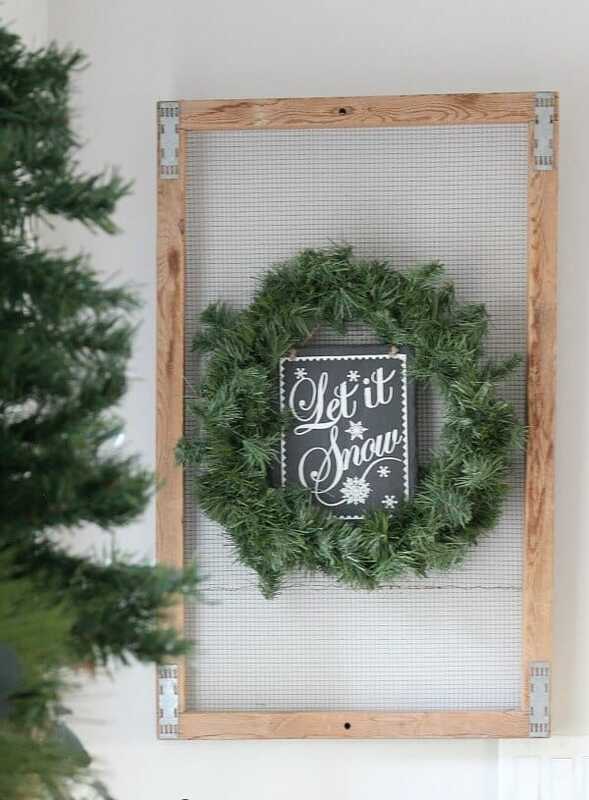 Without a doubt – I love this fun garland! It’s tinsel strap ribbon I found at Hobby Lobby and I love how it curls down the tree whimsically. I certainly hope you enjoyed my Cozy Christmas Family Room. 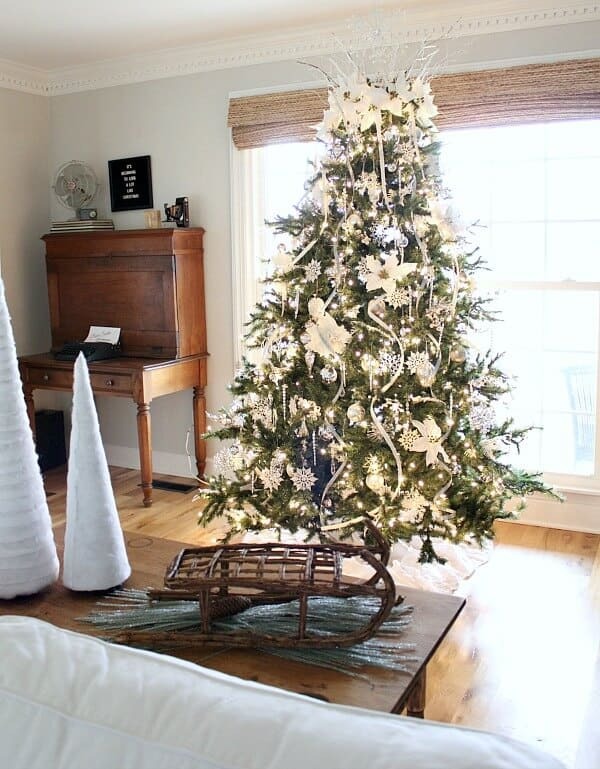 Not overdone or grandiose, but simple, welcoming… and just right! 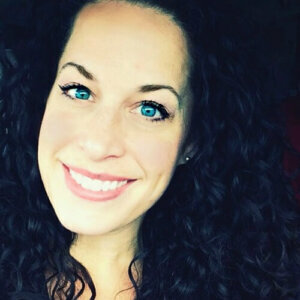 Lastly, I wanted to take a moment and say a huge thank you to Jenna from Wife in Progress for putting together such an amazing and inspirational group. And especially for all her hard work gathering the details of this tour of homes. I hope you enjoy the rest of these bloggers as much as I have this week! 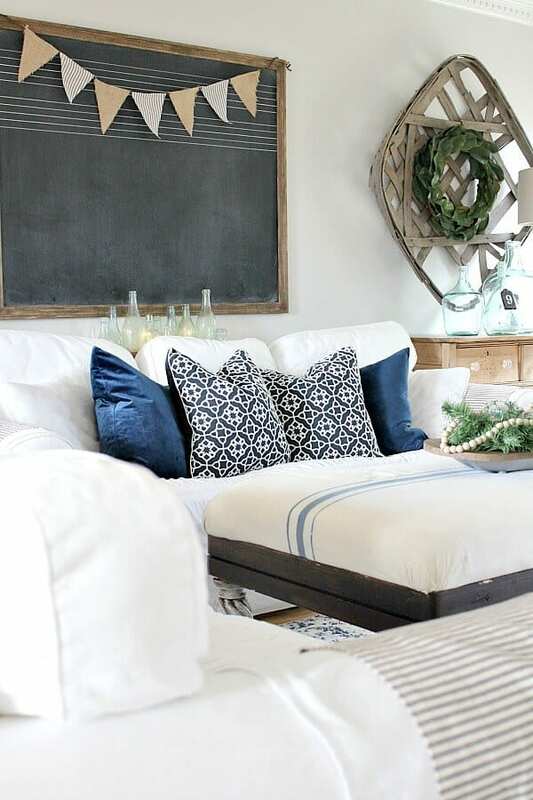 Next on the hop is Krista from Making It In the Mountains, so head over to see her beautiful home! Hi Jen! I love all your blue combined with the neutrals and greens. 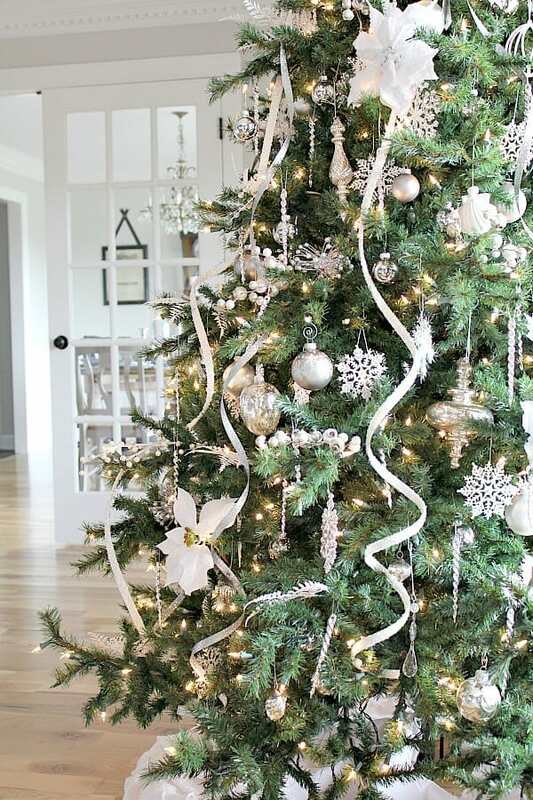 I’m definitely trying your tree ribbon trick next year! Happy Holidays to you and your family! 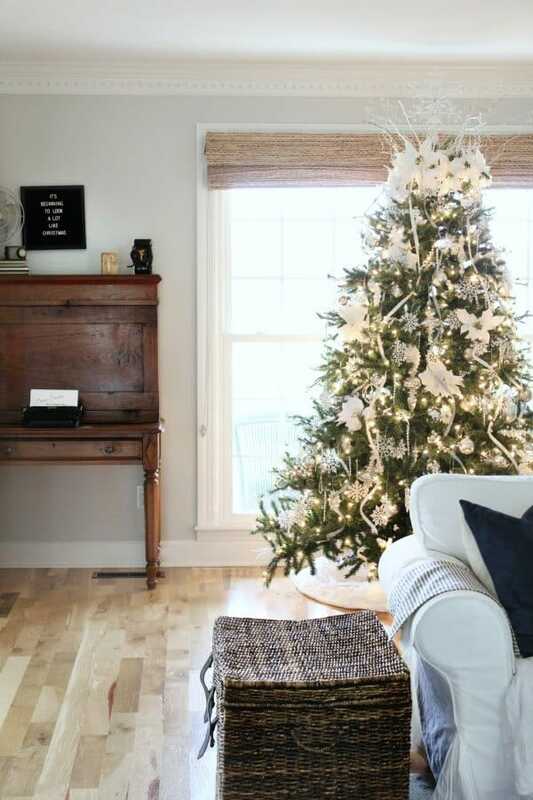 What a beautiful tree and I love your plantation desk and hall tree settee. So glad you’ve not painted them. 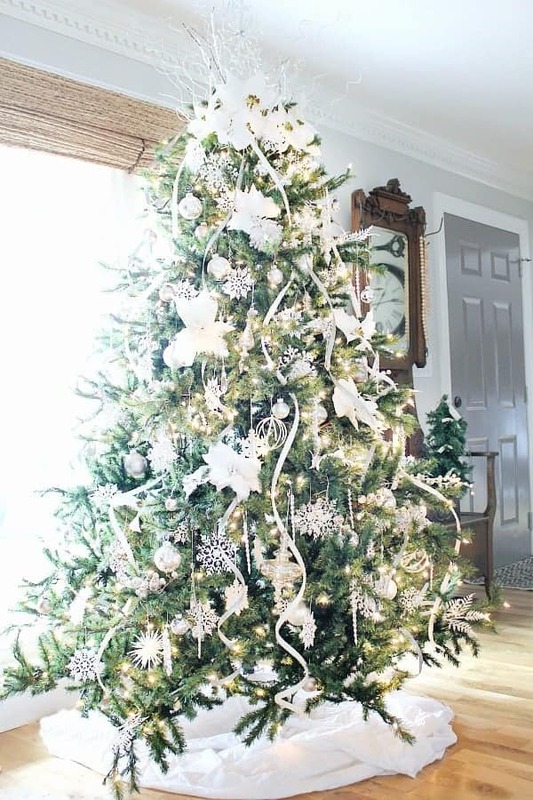 The tinsel strap ribbon is such a delightful addition to the tree. Thanks for the tip! What a beautiful tree. I love everything about it. Ann – you are so kind! Thank you for taking the time to comment – Merry Christmas to you! Thank you Teddee – those heirloom pieces are treasures and I wouldn’t dare paint them! 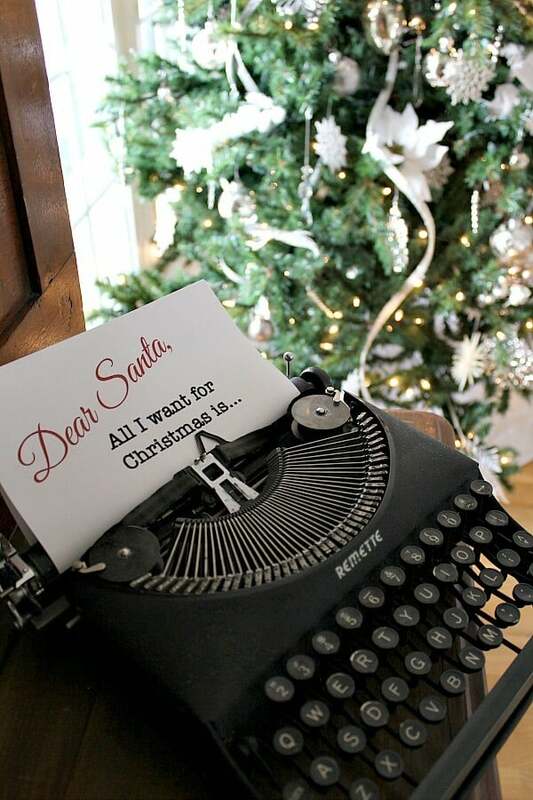 So glad you like them too – Merry Christmas to you! 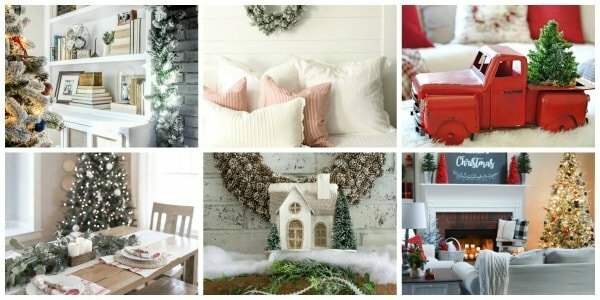 Everything looks SO beautiful and cozy! Happy holidays my friend! You have a lovely home! I adore your antiques! Jen, your home is beautiful! 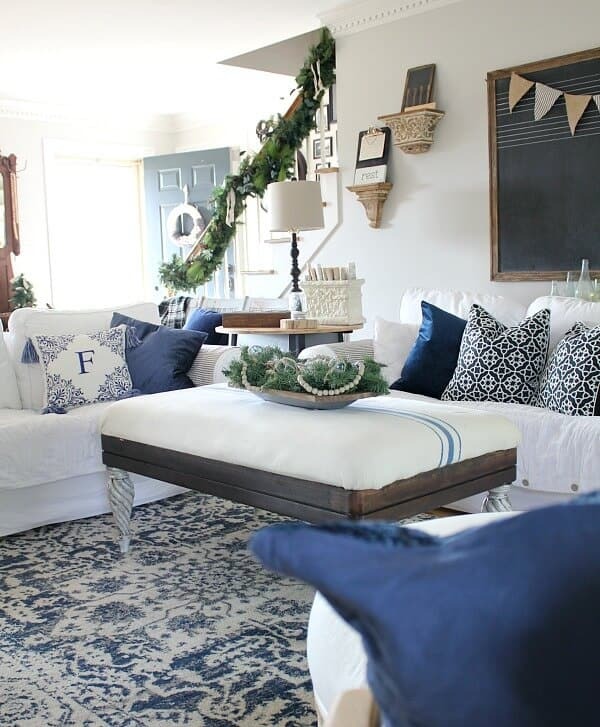 You have all my favorites shades of blue combined with warm wood tones…it’s stunning. 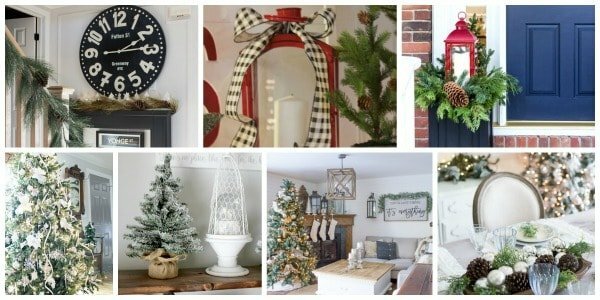 Merry Christmas and thank you for participating in this blog hop!! Thank you Kristi! Merry Christmas to you and your family! Jenna – you are so sweet! Thank you so much for inviting me to join in on the fun – this has been so inspirational and fun! Merriest of Christmases to you! Jen, I always love your tours! Your style is beautiful! 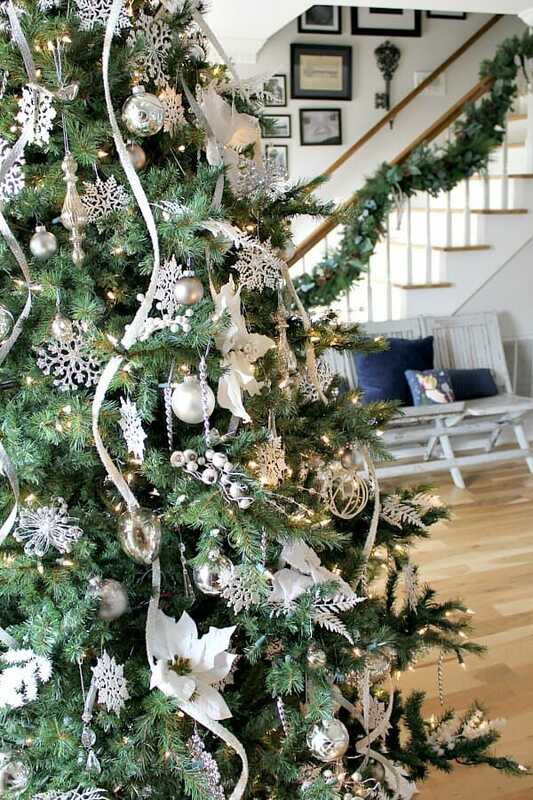 That hall tree at the entry is gorgeous and I love your white theater chairs and the tree is beautiful! I could go on and on! You have a beautiful home! Merry Christmas! Lindsay – you always say the kindest things! Thank you for taking the time to bring a smile to this face! I love everything! your color scheme is just gorgeous. 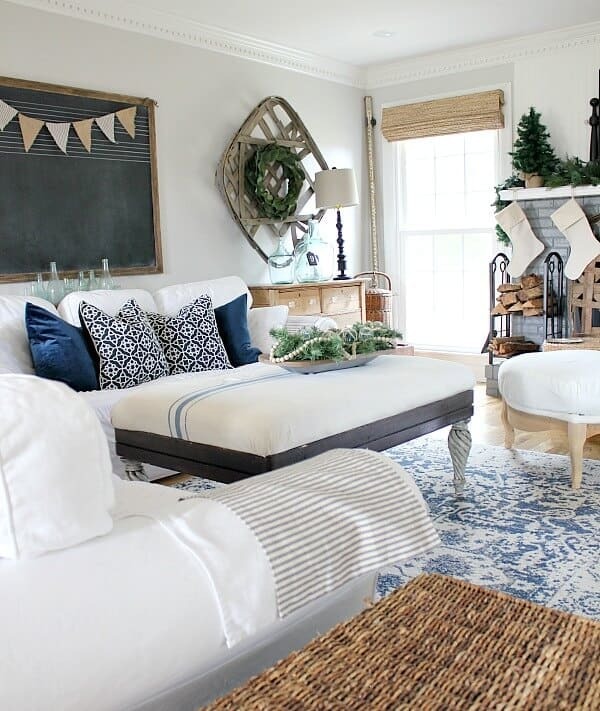 I love all of your pretty bottles and pillows – and that coffee table! Jennifer ~ I love the blue and white. 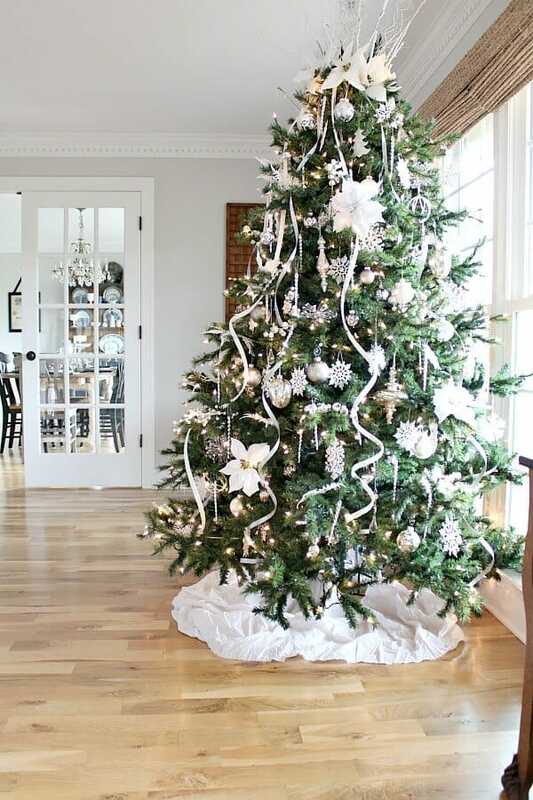 Your snowflake tree was so pretty and then I saw the topper and it became amazing. Wonderful that you found those pillows with a snowflake motif. 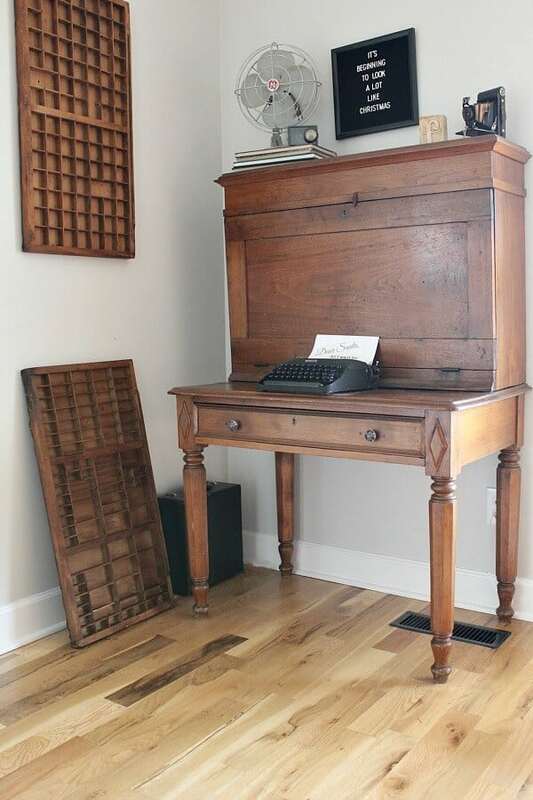 The vintage typewriter is a rare find and the letter is a sweet touch. Happy to be sharing the blog hop for another week. Carol – your words bring me such a huge smile! Thank you for your kindness! So pretty! 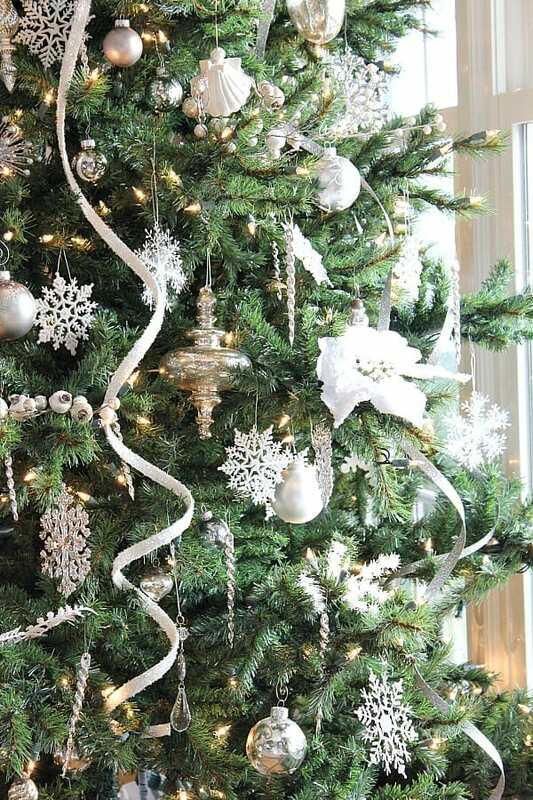 I love how the ribbon curls so gracefully on the tree. 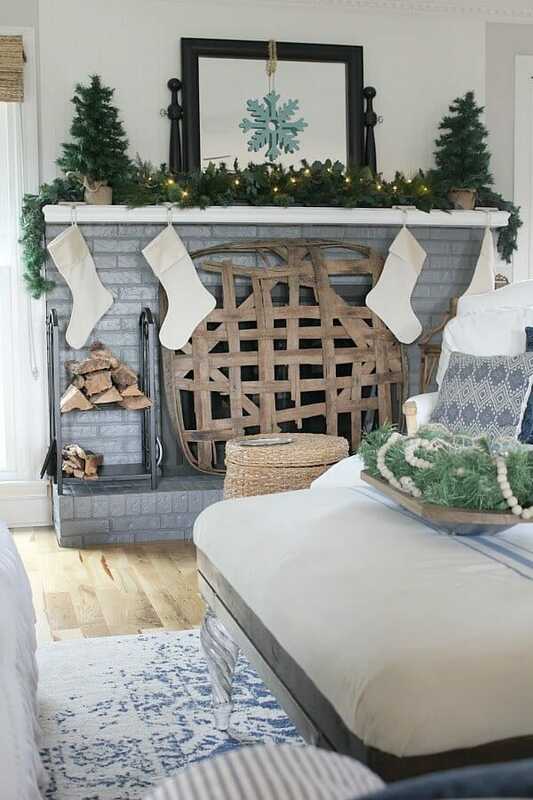 Plus that tobacco basket in front of the fireplace is PERFECT! Thank you Michele! Merriest of Christmases to you and your family! Thank you Janet! It was so wonderful seeing all the beautiful homes! Merry Christmas to you! Your tree is so beautiful and I love all the blue!! Gorgeous!